This is a sponsored post from Skate at Somerset House presented by Tiffany & Co. Need a new year pick me up this weekend? Combine an invigorating evening skate with an infectious club night soundtrack courtesy of Skate at Somerset House. If you avoided London's most beautiful ice rink in the hectic run up to Christmas, make the most of this new year opportunity for a fun and funky foray into skating. On Friday night DJ Edward Adoo plays an eclectic mix of House, Electro, Dubstep, Drum & Bass, Hip Hop and Reggae to soundtrack your ice dancing. On Saturday night it's house and disco from Bad Zuke of The Jinks. Before and after your time on the rink, hang out with friends, enjoy the music and the pretty lights and get refreshed. Yes, mulled wine is still on sale in Tom's Skate Lounge but so is the non-alcoholic Winter Sunrise cocktail, tea, coffee and that lovely hot chocolate with (or without) marshmallows on top. 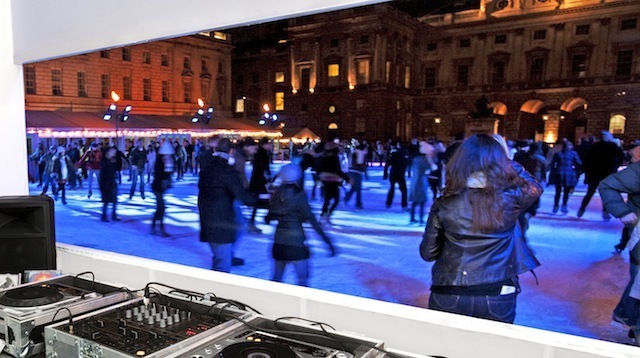 Skate at Somerset House is only open until 22 January so make the most of these special club nights while you can! Tickets for club night skate sessions cost £17 and start at 8pm, 9.15pm and 10.30pm. Book now.